Anna Got Her Dream Hair (Thanks, Extensions)! I LOVE blue-black hair. Both hair that is so black it's blue, and black hair with blue highlights or balayage added in. When I got my Wonder Woman tattoo I made sure the artist added blue highlights in her hair. However since I have been colouring my hair as blue-black as humanly possible since 2013, the likeliness of me getting my hair light enough without severely damaging hair to get blue highlights was slim. Once I asked Gianni what she would do if I asked her to colour my hair blue. She just stared me down and said, "No.". One day it finally came to us, extensions! I've always thought of extensions as being used for length and volume, but it never really occurred to me to use extensions for colour. Lisa put blue tape-in extensions in my hair and instantly I had my comic book blue black hair! 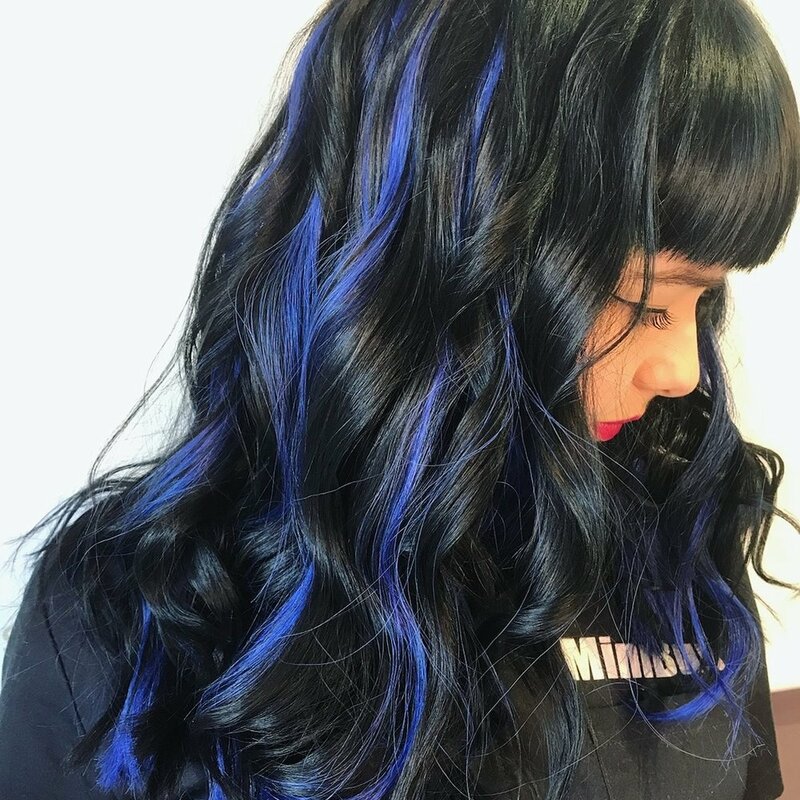 With how my hair is cut, 6 extensions were the perfect amount for pops of blue to come through my black hair. And with those 6 extensions, my dream hair was achieved instantly without having to lighten and potentially damage my hair. Extensions are a viable option for those wanting big colour changes who don't want to potentially damage their hair. With the amount of colour options, and having the ability to custom colour extensions as well, we can give you the hair of your dreams instantly, for about the same price, and in a fraction of the time that colouring hair takes- without risking the integrity of your hair. For the month of April we are taking 20% off the price of extensions! We offer both tape in and fusion extensions. If you've been curious about extensions but worried about the price, now is a great time to try them out! I’ve never truly experienced hair breakage before. Not like I’ve experienced within the last seven months. In August, I made the decision to strip almost three years of black color from half of my hair. I wanted my dream hair; half black and half red. I knew, from a color theory standpoint, that this would not be difficult. Red is the underlying pigment of all dark colors, especially black. I knew the process wouldn’t be long, maybe one sitting for a few hours. I’ve been a color correction multiple times, and have cut off the appropriate amount of length after having lightener on my hair for up to eight hours. This was nothing. 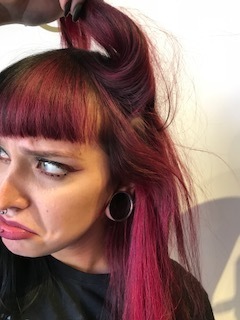 Over the last few months, due to the hard water in Chicago, the severe weather changes, and of course heat styling -the entire front inch of my hairline broke off. The length was approximately two inches long. The result, besides hair length loss, appears that the front of my hair on the lightened side is scraggly and thin. While I have always come to terms with hair breakage, this is not something I have ever experienced. -A heat protectant before any heat styling. I really love Kevin.Murphy’s Staying Alive and Beauty & Pinup’s Fever. How I typically apply this is I will liberally distribute the product throughout all of my hair, blow dry it in, and if I’m feeling frisky, use an additional hot tool for style. -HAIRCUTS!! Capitalization, bold, underscore, italics. This is more important than any product you could put on your hair. I just cut off an inch of my hair, as I am also trying to grow it out for the first time in my entire life. To have healthy hair growth, YOU MUST CUT YOUR HAIR. I don’t mean massive chops every time. I mean every 8-12 weeks, at least half an inch. Scraggly ends are not pretty and can actually make the hair appear dull and shorter than it actually is. -Optional: Extensions. I know this option is not always cost effective for everyone with broken or damaged hair. Extensions can last anywhere from 2-6 months before re-installation. I was lucky enough to have access to a few that I custom colored to match the side they were being installed to. This can alleviate a lot of anxiety and insecurity with the loss of length that comes with a lot of breakage. We used HairDreams wefts and I only needed three “sandwiches” as we call it, six small wefts taped together. It honestly is that simple. We as hair stylists want you to have beautiful, healthy hair. We suggest products for you to take home not to sell you things, but to educate you and to help you maintain what we can do for you in our chairs. We don’t suggest frequent haircuts because we want you to have short hair, we want you to have healthy ends. Healthy ends means multiple possibilities, even if you like simple, classic hair. We do too! And we love seeing your healthy hair journey progressing. 14 Days of Xmas at Streets of London! Sundays: $50 off Brazilian Blowouts! Is Aunt Martha always commenting on how frizzy your hair is? Not any more! Brazilian Blowouts smooth and straighten hair for up to 10-12 weeks. Mondays: $10 off haircuts! Shock everyone by doing a massive chop! Or a nice trim and reshaping, up to you. Tuesdays: 20% off full size products and gift sets! Give everyone on your list the gift of lovely hair, or stock up for yourself. Treat yo’ self, we don’t judge. Sale includes Kevin Murphy, Beauty and Pinups, Pai Shau, Joico, Color Proof, Viral, and Brazilian Blowout. Thursdays: 50% off all treatments! It’s winter in Chicago, be sure to give your hair all the nutrients and moisture it needs. Includes Kevin Murphy and Olaplex treatments. Fridays: $20 blow dries! Get your hair styled and ready for the weekend. One less thing to worry about! Saturdays: $20 off colour services! Yes, ALL colour services. Balayage, creative colour, all over colour, highlights! All the things! We also offer Streets of London gift cards, give someone in your life the gift of awesome hair. Have a wonderful holiday season, and we look forward to seeing you soon!